Garden City is a village in the town of Hempstead in central Nassau County, New York, in the United States. It was founded by multi-millionaire Alexander Turney Stewart in 1869, and is located on Long Island, to the east of New York City, 18.5 miles (29.8 km) from midtown Manhattan, and just south of the town of North Hempstead. A very small section of the village is in North Hempstead. As of the 2010 census, the population of the incorporated village was 22,371. The Garden City name is applied to several other unincorporated, nearby jurisdictions. In the region, hamlets such as Garden City South, Garden City Park and East Garden City are adjacent to the incorporated village of Garden City, but are not themselves part of it. Roosevelt Field, the shopping center built on the former airfield from which Charles Lindbergh took off on his landmark 1927 transatlantic flight, is located in East Garden City. Adelphi University's main campus is located in Garden City. Parenthetically, the name "Garden City" pre-dates that of the Garden City Movement which was established some years later near the end of the nineteenth century. The central attraction of the new community was the Garden City Hotel, designed by the acclaimed firm of McKim, Mead & White. Although the original structure, as well as that which replaced it at the end of the 19th century, were torn down many years ago, a hotel still stands on the original grounds, as do many nearby Victorian homes. Access to Garden City was provided by the Central Railroad of Long Island, another Stewart project which he undertook at the same time. The railroad's Hempstead Branch opened in 1873. Stewart's wife, Cornelia, founded the St. Paul's School for boys, St. Mary's School for girls, a Bishop’s Residence and the Gothic Cathedral of the Incarnation, which is today the center of the Episcopal Diocese of Long Island, as well as the final resting place of Alexander Turney Stewart and Cornelia Stewart. This elaborate memorial was completed in 1885. Mrs. Stewart died the following year. In 2008, the Cathedral of the Incarnation underwent a multimillion-dollar renovation and rehabilitation project, which was completed in 2012. Voters selected Mineola (in the town of North Hempstead) to be the county seat for the new county of Nassau in November 1898 (before Mineola incorporated as a village in 1906 and set its boundaries), winning out over Hicksville and Hempstead. The Garden City Company (founded in 1893 by the heirs of Alexander Turney Stewart) donated four acres of land for the county buildings just south of the Mineola train station and the present-day village of Mineola, in the town of Hempstead. The land and the buildings have a Mineola postal address, but are within the present-day village of Garden City, which did not incorporate, nor set its boundaries, until 1919. 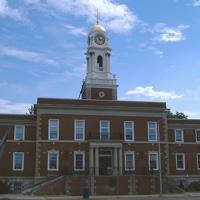 The early village did well due to its proximity to Hempstead, at that time the commercial center of Long Island. In time, thanks both to the railroad and automobiles, Garden City’s population increased. In 1910, Doubleday, Page, and Co., one of the most world's important publishers, moved its operations to Garden City, which include its own train station. The Doubleday company purchased much of the land on the west site of Franklin Avenue, and estate homes were built for many of its executives on Fourth Street. In 1916, company co-founder and Garden City resident Walter Hines Page was named Ambassador to Great Britain. In the 1920s, the community continued to grow, with houses built in Garden City Estates as well as the eastern section of Garden City. This development included the Mott Section, developed by the heirs to the Mott's apple juice fortune, which was spurred by easy access to the now-defunct Long Island Motor Parkway, as well as the establishment of the Doubleday publishing group’s corporate headquarters. Doubleday's headquarters, known as Country Life Press, remained in Garden City until Bertelsmann took over the firm in the mid-1980s. The plant closed in 1988 and has since been converted to offices for Bookspan, a media firm partly owned by Doubleday. Housing construction slowed after the 1929 stock market crash. But in the 1930s, hundreds of houses were built to accommodate a population boom, though Garden City used a strict zoning code to preserve Stewart’s vision. Alone in central Nassau, the village retained a sense of orderly development, true to its rigorously planned roots. Mitchel Air Force Base, located on the far east side of Garden City, served as a United States Air Force base from 1918 through 1961. As of 2008, the U.S. military still retained a limited physical presence there, with the rest of the base occupied by housing, Hofstra University, Nassau Community College, the Long Island Children’s Museum, the Nassau County Firefighters Museum and Education Center, a Sony IMAX theater and the Cradle of Aviation Museum. After World War II, following a trend of urban residents moving to the suburbs, Garden City continued to grow. Post-war construction filled out the present borders of Garden City with many split-level and ranch-style homes, with construction occurring in the far eastern, northern and western sections of the town. The Waldorf School of Garden City was founded in 1947 (one of the first Waldorf schools in the United States), originally as a part of Adelphi University. The village's current public high school was also constructed during this time. In the 1970s, the old Garden City Hotel declared bankruptcy, and subsequently closed. The hotel was later demolished, and Garden City lost one of its grandest and most historical landmarks. A new Garden City Hotel was constructed on the previous site of the old Garden City Hotel. In 1978, 50 of the original structures collectively known as the A. T. Stewart Era Buildings were designated a national historic district and listed on the National Register of Historic Places. In the late 1990s and early 2000s, the village's downtown areas (New Hyde Park Road, Seventh Street and Franklin Avenue) benefited from a renewal campaign and new construction. Bloomingdale's has moved from Franklin Avenue to the Roosevelt Field Mall. Lord & Taylor has a large freestanding location that opened in 1956 on Franklin Avenue, which is still there today. Sears now occupies the building that was once home to Bloomingdale's. Several luxury restaurants have also opened in recent years along this avenue. 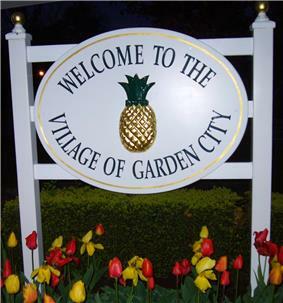 Garden City is located at (40.726885, -73.649720), in central Nassau County, New York. According to the United States Census Bureau, the village has a total area of 5.3 square miles (13.8 km²), all land. The village lost some territory between the 1990 census and the 2000 census. In addition to the Village of Garden City, the Garden City 11530 zip code includes another incorporated village, Stewart Manor and two unincorporated areas of the Town of Hempstead, Garden City South and East Garden City. Garden City included 7,386 households out of which 36.1% had children under the age of 18 living with them, 69.8% were married couples living together, 7.5% had a female householder with no husband present, and 20.7% were non-families. 19.2% of all households were made up of individuals and 12.0% had someone living alone who was 65 years of age or older. The average household size was 2.83 and the average family size was 3.27. In the village, the population was spread out with 26.5% under the age of 18, 4.7% from 20 to 24, 7.2% from 25 to 34, 42.6% over 45, 21.6% over 60 and 1.9% who were over the age of 85. The median age was 41 years. For every 100 females there were 90.5 males. For every 100 females age 18 and over, there were 84.1 males. Garden City is served by its own school district. There are seven schools in the Garden City School District: three primary schools (Hemlock School, Homestead School and Locust School), two elementary schools (Stewart School and Stratford School), the Garden City Middle School (grades 6-8), and finally, the Garden City High School (grades 9-12). The primary schools function as a single unit, with three campuses spread across the village. One independent school, the Waldorf School of Garden City (grades pre K-12), and two Roman Catholic elementary schools (K-8), St. Joseph School and St. Anne's School, are located in Garden City. The former St. Paul's School and St. Mary's School are now defunct. Garden City is the namesake of Garden Village, Kentucky. Liza Huber, actress, Soap Opera "Passions"
Kathleen Rice 4th District of New York Representative, Grew up in Garden City on Nassau Boulevard. Johnny Sylvester (1915–1990), received as a seriously ill child a promise from Babe Ruth that he would hit a home run in the 1926 World Series on his behalf. The entertainment film The Spirit of St. Louis (1957), starring Jimmy Stewart, features Charles Lindbergh's historical flight to Paris from Roosevelt Field in Garden City in 1927. Its first few scenes occur at the Garden City Hotel, where Lindbergh had a room reserved (but did not use, contrary to the film's portrayal), and the press corps stayed who were covering the event spent the night prior to his flight; Lindbergh was up all night working on his plane the night before the flight, although he did have dinner and take a nap at the Garden City home of his mechanic, Charles Brandewede, at 105 Third Street. The opening shot of the film's first scene shows the hotel's front exterior and sign. Subsequent scenes take place in Roosevelt Field. ^ Rennick, Robert. Kentucky Place Names, p. 113. University Press of Kentucky (Lexington), 1987. Accessed 1 Aug 2013. ^ Richard Goldstein, Dave DeBusschere, 62, Relentless Forward On Knicks' Championship Teams, Is Dead, New York Times, May 15, 2003. Accessed online 2009-10-28. ^ Strickland, Carol. "Novelist Uses The Island's Gold Coast As A Setting For A Clash of Cultures", The New York Times, April 8, 1990. ^ La Gorce. "Arts/Long Island: All About the Woman Behind Erica Kane." The New York Times, March 18, 2011. www.nytimes.com. Retrieved November 26, 2013. ^ Elliott Murphy, My Many Hometowns..., elliottmurphy.com. Accessed online 2009-10-28. ^ Mark Mulvoy, No Roses For Garden City Joe, Sports Illustrated, September 29, 1975. Accessed online 2009-10-28. ^ Home page, tellysavalas.com. Accessed 2009-10-28. ^ Thomas, Robert McG., Jr. "Johnny Sylvester, the Inspiration For Babe Ruth Heroics, Is Dead", The New York Times, January 11, 1990. Accessed June 28, 2009. ^ Film: The Spirit of St. Louis, directed by Billy Wilder, released April 20, 1957. ^ Wikipage: The Spirit of St. Louis (film), Production paragraph 3.